There are soups and stews that demand a bit of care and attention, and then there are soups and stews that require very little fuss. And in times like today when I’m fighting off the last bit of a cold, and patience for cooking is sparse, it is soups like the latter that I often make. I first made this several years ago, I was at the time, again, not feeling well. A friend of mine came over for a visit, and this soup was the only thing I had to offer her. I was a little shy about serving it to her because it was a last minute meal I made with the few ingredients that I had on hand, which included pantry and freezer staples like quinoa, lentils, and frozen spinach. And although the soup tasted well enough for me, I was sick and wasn’t certain that my weakened sense of taste or impatience to cook anything else that would required more effort had anything to do with my delight with my soup. To my surprise, she enjoyed it enough that she had two additional servings. She thought that soup had a “restorative” quality to it, hence the name. 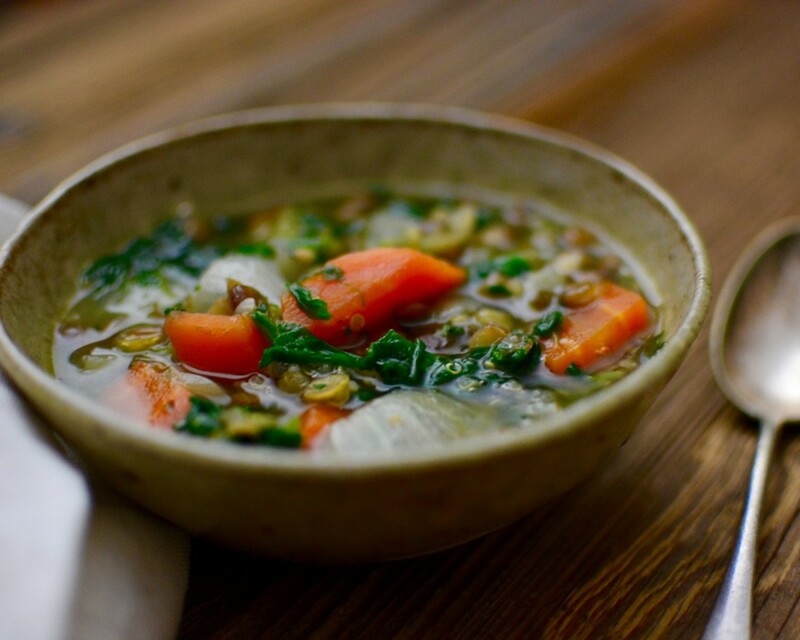 The lentils and quinoa add protein and heft to the soup. Lentil beans are fantastic, because unlike most other dried beans, they don’t require any soaking and cook in about 30-45 minutes. Quinoa, which many think is a grain, but technically is a seed, is a complete protein, which means it contains adequate amounts of all nine essential amino acids that our bodies don’t produce. I feel plant based proteins are absolutely necessary, especially at times when one isn’t feeling well. If you haven’t cooked with quinoa yet, don’t be intimidated. It cooks in just the same way rice does. Even the proportions of grain to liquid are the same, one to one and a half, grain to water. The only caveat to quinoa is that it must be rinsed. Rinsing quinoa washes away the bitter coating from its skin, so make sure you don’t skip this step. I use a fine mesh strainer and run it under the tap for about 10 seconds, while combing through the quinoa with my fingers. In my opinion, some frozen vegetables are disastrous, like carrots and broccoli. Luckily, not all frozen vegetables are. I think peas, corn and even onions from the deep freeze can be marvelous, depending on how you prepare it. Frozen spinach is great in just about any recipe that requires spinach to be cooked. It saves you time from having to wash and cook down a ridiculous amount of fresh spinach. Recently, I was ecstatic to find spinach frozen into miniature tater tot-sized portions (gastronomically speaking, it doesn’t take much to get me excited). The little pods are perfect for portioning out frozen spinach for soups and stews. The lentils and spinach are wonderful sources of insoluble fiber, which aid in the removal of toxins from the body; which could mean a speedier recovery time. Just knowing that a pot of this is simmering away on the stove is enough to make me feel better. Heat the coconut oil over medium heat in a large pot (5 quart pot or larger). Add the onion, garlic and celery and sauté until the onions are slightly translucent, about 5 minutes. Next, add the carrots, thyme, crushed red pepper, 1½ teaspoon of sea salt and ½ teaspoon of fresh ground black pepper (you may need to add additional salt depending on how salty your stock is). Continue sautéing for another 5 minutes. Next, add the lentils and stock. Raise the heat to high and bring the pot to a boil. Once it boils, lower the heat to a steady simmer. Simmer the lentils for 15 minutes, and then add the rinsed quinoa. Continue to cook until the lentils and quinoa have fully cooked, about another 15-20 minutes. Just before serving, add the spinach. Allow the spinach to heat through. Check for seasonings, adding more salt if necessary, and serve.